Bartın located in north part of Turkey and between Istanbul to Bartın is 420 km. 80 kms east of Zonguldak is Bartin, the comely city of timbered houses which has the remains of a Roman road. This lovely city hosts strawberry festivals in spring. The city also has beaches of good quality. 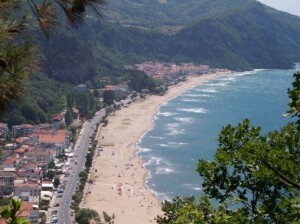 Inkum, a lovely setting with a holiday village and other facilities, has sandy beaches. Carkaz, is a fishing village which has an excellent beach while at Kurucasile fishing boats are built. Amasra was founded in 6th-century BC and its ancient name was Sesamos. It is one of the highest spots on the Black Sea Coast which displays unimaginable, fascinating beauties while travelling through. The city is located on a peninsula and the eastern side is especially good for swimming. The archaeological museum and Cekiciler Street are of interest, too. As a souvenir you may purchase hand-carved, wooden articles.